Sediment, dirt, and other particulates in water are responsible for clogging faucets and washing machine lines and causing toilet malfunctions. Chlorine and other properties that make up your water can cause a bad taste. A very easy way to solve these problems is through simple filtration. 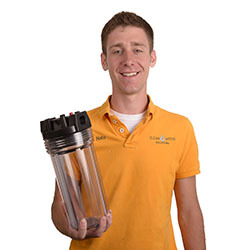 Backwashing Carbon and Heavy Iron Filters – for heavy taste, odors and dirt load for water that tastes badly, runs brown or causes stains on your appliances.